Ahh, season 3 of Buffy the Vampire Slayer. Where so many things changed. Also, my second favourite season of the show. Mostly because so much happens in this one season. Buffy comes back to Sunnydale, Angel comes back from his little holiday in hell, there’s a peppy new slayer in the shape of Faith (Who really shakes things up. ), we got a new watcher in the shape of Wesley and we’ve got one of the best villains of the show – Mayor Richard Wilkins. One thing I did notice on my rewatch was just how many dream sequences there were in this season. I know, there were a few in the first couple of seasons. But in the first few episodes, every episode had a dream sequence. In Anne there’s Buffy’s dream with Angel on the beach. Dead Man’s Party had Buffy dreaming she was walking around an empty Sunnydale High School. There’s another Buffy/Angel dream in Faith, Hope & Trick. They really did up the importance of Buffy’s dreams. All the way to one of the most important dream sequences in the history of Buffy – Graduation Day Part 2: Faith gives the countdown to Dawn’s arrival. I remember my mind being blown when I found that out when season 5 started! Another big thing I loved about season 3 was how they started to really elevate Angel. With his spin-off in the pipe line, they really made sure that Angel was given enough limelight to make sure his spin-off would have a decent fanbase to start. It worked too well on me. When I finished with season 3 all I wanted to do was start on Angel season 1! Faith had a pretty good entrance too. Her appearance on the show was a total surprise for me, originally. Eliza Dushku as Faith is the only role I think she can do and she’s good at. I guess that would make sense. The whole Buffy and Faith dynamic was one of my favourite things about the season. Mostly because it gave us some of the best episodes – Bad Girls, Consequences, Enemies. Oh and while on the topic of Enemies, the moment when Angel says ‘second best’ could be one of my favourite Angel moments of the season. Gives me chills every single freaking time! Whoever thought of creating that relationship between Faith and Angel? I want to give them a hug. I don’t ship them, but their relationship is just so damn interesting. Okay, it gets more interesting in Angel. But the seeds were sown here. Every single character had their own episodes to shine in too. Heck, even Spike came back for his own episode. Out of The Zeppo, Dopplegangland, Homecoming, Lover’s Walk, Amends and Helpless, I can’t choose which is my favourite single character-centric episode. I have a soft spot for all of them. One of my favourite moments out of the whole season from the very Giles centric episode, Helpless. Dead Man’s Party: When Buffy’s almost on her way out the door again. Faith, Hope & Trick: When Buffy tells Giles Angel was soul’d up when she killed him. But it was Giles’ real intentions of why he wanted to know that got me crying! Amends: When Angel goes out to let the sunrise kill him, but it ends up snowing. Helpless: Giles’ fatherly love for Buffy is made all the more obvious. The Prom: Class protector award giving. Oh my god the tears! Then more tears when Angel arrives. Graduation Day Part 2: When the student body brings on the fight and when Angel says goodbye. Buffy season 3’s finale, Graduation Day, is epic. They blew up the freaking school! Buffy nearly killed Faith! (That fight sequence is one of the best choreographed fight sequences I’ve seen on TV.) Xander got to play military man again! The Mayor turned into a giant snake. Right, it wasn’t a very good looking snake, but that’s beside the point. The whole student body got the be part of the fight. That moment, where the students get rid of the robes – chills and tears! Yes, that one moment brings tears to my eyes. It’s such an excellent scene. My favourite from this season of Buffy? Revelations, Lover’s Walk, The Wish, Helpless, Consequences/Bad Girls, Enemies and Graduation Day. A lot of them. Be easier the list my least favourite episodes. My second favorite, too, after season two (season one being my first). I sometimes forget we’ve known each other at least since this season – it’s weird to even think in terms of that many years! 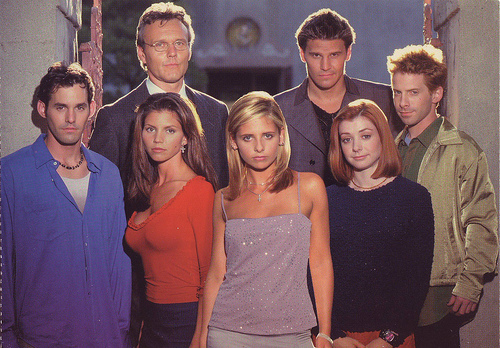 Season three of Buffy seems like the last season of the Buffy I had been watching and, simultaneously, the first season of the show it would be for the next two years until the UPN shake up when everything changed again. Love, love, looove this show – it’s still my favorite, after all these years. Sorry – season one being my *third* favorite, not my first. Pretend I’m awake, lol. It has been YEARS, hasn’t it, Faith? Season 3 was way back in 1999, so it’s been 14 years! JEBUS! Time fricking flies! Think Buffy will remain a favourite of mine for a long time. Heck, maybe even forever. Everyone has that one show that they recall from their youth. Buffy’s mine. Well, and Angel too. Together they’re that for me! Oh my god, the class protector award! Hmmm… yes, that gif… I need to stop staring! HAHA You do sell it well matey…. mmmmm Faith…. Haha! Faith was a hottie. I have to admit that. Crazy though!